A new book documents Europe’s loss of humanity as refugees struggle to seek a haven away from wars and degradation. 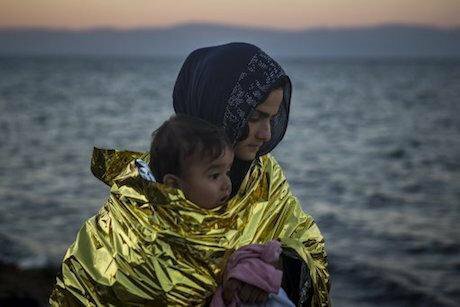 Woman and child, Lesbos, 2015. Santi Palacios/AP/Press Association Images. All rights reserved.Escaping wars, destruction and poverty is simply human. The unequal world in which we live has always created conditions for desiring escape. When Europe calls the refugees’ desperate attempt to enter the continent a ‘migrant crisis’, we know that in reality it is a crisis caused by inequality, war and conflict, as a recent briefing released by Global Justice Now points out. With rich countries building up fences and strengthening their borders, the poor of developing countries lose their lives. According to the International Organisation for Migration, over 25,000 people have died in their attempt to reach or stay in Europe since 2000. Last week, more than 700 refugees drowned in the Mediterranean over three separate crossings from Libya: the highest death toll of sea-crossing refugees in more than a year. The dehumanising EU-Turkey deal that went into effect on 20 March 2016 to deport refugees reaching Greece back to Turkey has, as predicted, prompted people smugglers to return to dangerous routes through Libya to Italy. More people are expected to take these routes in the coming months. In Crossing the Sea: With Syrians on the Exodus to Europe, a new book written by Wolfgang Bauer, a reporter for Die Zeit, the story of Europe’s loss of humanity is told in refugees’ tremendous effort to seek a haven away from wars and degradation. Most of them are from Syria, where the bloody conflict, according to UN, has killed 250,000 people and displaced more than 12 million since 2011. Bauer and photographer Stanislav Krupar went undercover in an attempt to uncover the harsh reality of sea-crossing for the refugees. They posed as English teachers in 2014, and witnessed the extreme vulnerability of refugees – their personal safety constantly put at great risk by the network of profiteers created by the clandestine crossing arrangements. And this is before they even got on the boat, and set out on their sea journey. Bauer and Krupar were housed in an apartment in Alexandria, Egypt, by the smuggler, and experienced the desperate period of waiting for their crossing, alongside Syrian refugees whom they befriended. As a group, they were kidnapped by a local gang and were eventually released after their smuggler paid the ransom. But when they were finally about to embark on their sea trip, they were arrested and detained. The two were then deported from Egypt to Turkey. Their fellow-traveller Syrians eventually got on a boat and left for Europe. What Crossing the Sea does best is give a face to the dehumanised ‘refugee crisis’ that we read about in everyday news headlines. Someone once told me that after reading about so many drownings of refugees, he sometimes feels numbed about what happened. But when there is a human face behind the news story, it is impossible to turn your attention away from it. It would be impossible to switch off your humanity. While doing so, Bauer points to Fortress Europe as responsible for the tragic drownings. People smugglers, operating similarly to unscrupulous travel agents, are choosing more and more dangerous routes as a result of the EU stepping up measures to close its borders. As the UN stopped recording the countless death toll of wars in Syria in early 2014, Europe also further tightened its borders, which Bauer said became death strips for refugees. “Europe’s birthplace, the Mediterranean, has now become the setting of its greatest failure,” he writes. Bauer and Krupar decided to actively challenge Fortress Europe when, a month after their deportation and return to Germany, they received a call from their fellow traveller Alaa, to tell them that he and his brother Hussan, who finally set out from Alexandria in Egypt, had made it to Europe by sea and were now sitting on an Italian warship. Bauer and Krupar became the ‘smugglers’ that they initially set out to investigate, much like the Danish children’s rights campaigner Lisbeth Zornig, who was prosecuted under people-trafficking laws, for allowing a Syrian family to hitch a ride with her to Copenhagen. Zornig’s husband was also prosecuted for the same ‘crime’, for taking the family into his home for coffee and biscuits and then driving them to the railway station where he bought them tickets to Sweden. When acts of humanity break the laws, we know that we are truly in dark times. Indeed, these prosecutions were brought in a country where the centre-right ruling party, Venstre, supported by the anti-immigration Danish Peoples Party (DPP), has recently passed a piece of law that allows authorities to search and seize valuables from asylum seekers, and to deny refugees the right to apply for their family to join them until they have spent over 3 years in the country. Venstre has openly said that these laws are passed mainly to keep people – and to scare people – from seeking asylum in Denmark. But such regressive tactics of fear will not succeed in keeping fellow human beings from taking the rational decision to seek a safe haven and betterment. Currently, Europe’s elites and corporate media are preventing Europeans from thinking outside of their box. Europeans need to start thinking about the ethics of shutting out the poor of the global south – while extracting resources out of the global south – and at the same time, granting freedom of movement to people, particularly the wealthy, of the global north. As Global Justice Now observes, this is little better than perpetuating apartheid on a global scale. When reaching the final few pages of Crossing the Sea, you cannot help feeling great relief that the ‘characters’ in the book have made it to their final destination, and at least will now have the opportunity to rebuild their lives. You feel relieved for them because you understand that they are not just characters in a book. They are flesh and blood, like you and me, and have every right to find security and hope for improvement of their lives. Crossing the Sea: With Syrians on the Exodus to Europe, by Wolfgang Bauer and Stanislav Krupar, is published by And Other Stories.